Kihaad is run entirely by the Italian tour operator Valtur. This is their ‘Paradise’ category holiday and as such the animation is softer and the day-to-day resort life is quieter and more easygoing than the other Valtur club destinations. The atmosphere is lovely. The Italian staff members are more than friendly, they are instant friends. There appear to be no rules or barriers beyond the injunction for everyone to get along together and make the magic work. The Maldivian staff, often longstanding and Italian speaking, understand this and play their part admirably. Ideally the setting would reflect and add to the atmosphere but here it has to be overcome, to some extent. Valtur took over a resort that was already complete, a resort built in a too, too solid and grandiose style. The reception is vast, for no apparent reason, and the restaurant is enclosed and formal, though it is wonderful on the deck outside where naturally everybody likes to be. 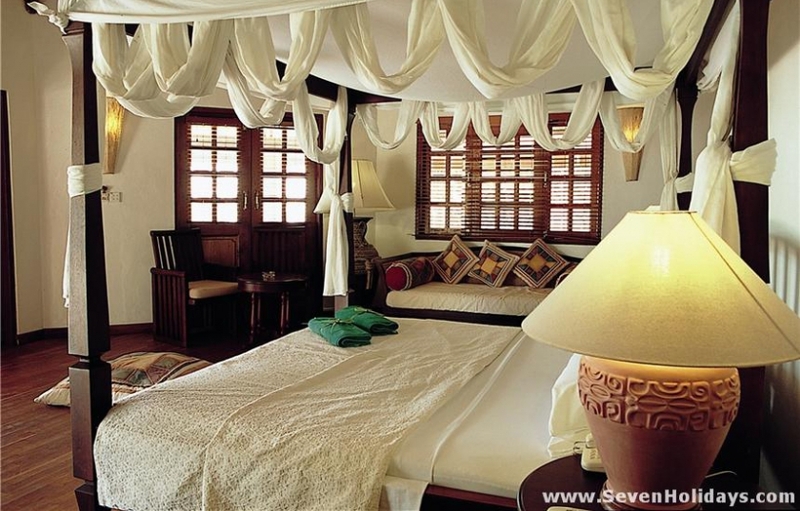 The beach rooms have thatch on top and coir rope around the concrete pillars but fail to be attractive and intimate. A fine draped 4-poster bed dominates the interior but the decor details, such as outsize ‘Greek urn’ lamps and a ghetto blaster cd player, are unsettling. The rooms are large, with a day bed as standard and space for another. The 18 Deluxe rooms differ from the 86 Superior rooms only in having a bathtub/jacuzzi as well as the shower. And, critically, face south on the best beach. 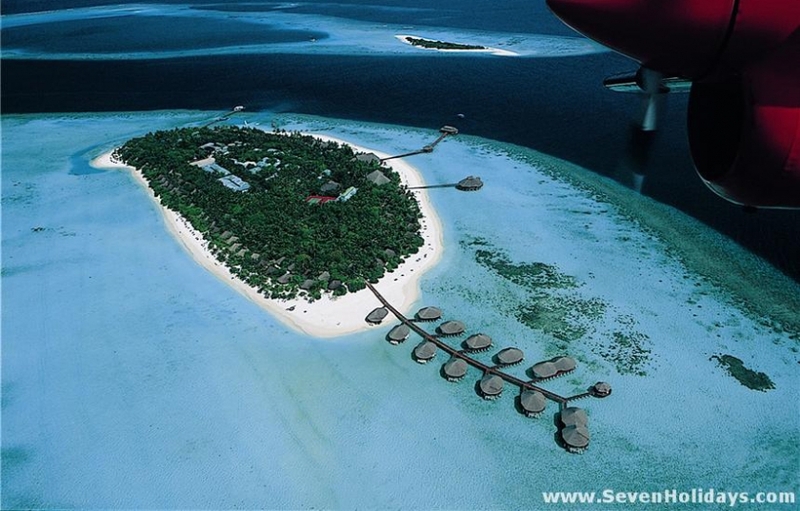 The 10 Over-Water Villas are essentially the same as the beach rooms except for being larger still. The 2 Over-Water Suites are also the same but have double the size, enclosed, with nothing to fill it. Half the waterbungalows face the sunrise and half the sunset, although a broad walkway around 3 sides allow guests to move their loungers to suit. 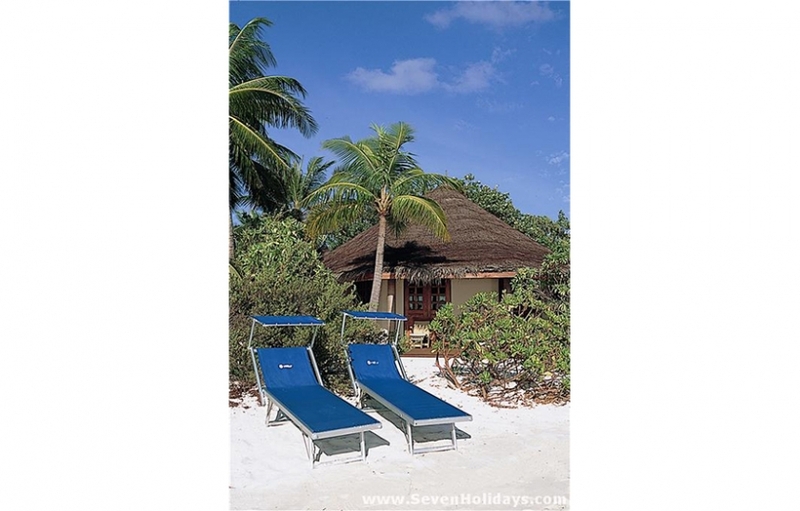 A vertical ladder gives access to the large, beautiful, sandy-bottomed lagoon. For most resorts the layout of the island would be a disaster but here it works. There are 2 rows of rooms, one behind the other and the majority of them face north, catching little direct sun. The best beach faces south and is fronted by the public area, from the restaurant to the reception and jetty to the swimming pool and bar. What happens is guests stay by their rooms for quiet moments but spend most of the time together, active or inactive, in this area. 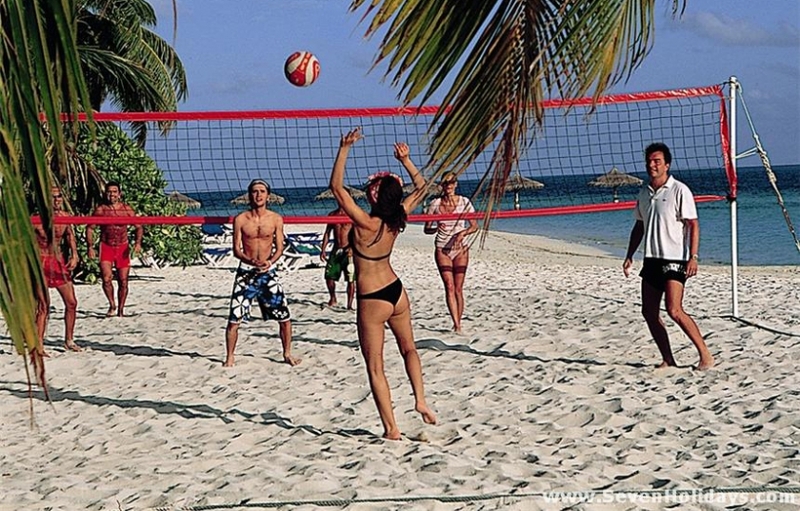 Aqua gym, volleyball and sunbathing during the day turn to music and aperitifs in the evening, massage or stretching demonstration and cabaret at night. A good swimming pool is surrounded by a broad deck for a pool bar, coffee shop, dance floor and seating, both shaded and open. 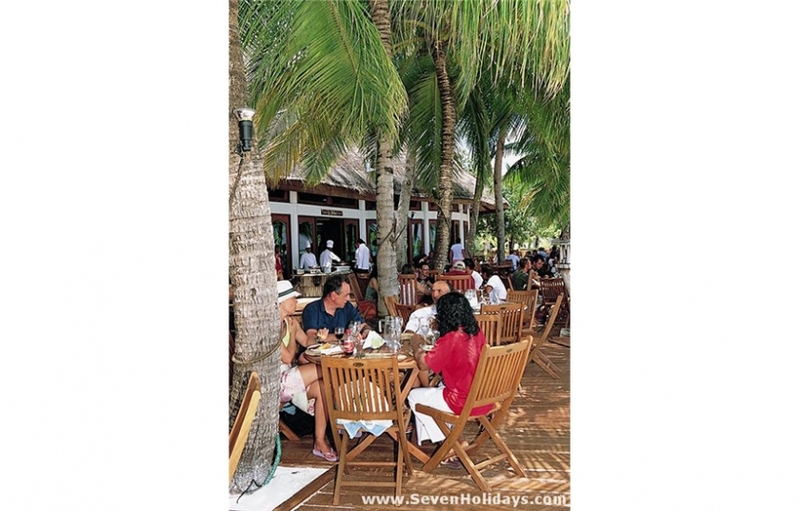 The deck outside the restaurant, pierced by illuminated coconut palms and looking out across the wide beach to the lapping waters of the lagoon, is one of the most attractive settings for an evening meal that I have come across. Candlelit and accompanied by a happy hubbub, any meal tastes that much better. Not that the food needs any more help, it is exemplary. Dinners are a mix of set plates, live cooking and a buffet of supplements and alternatives inside. The resort spa is at the end of its own jetty, at the edge of the public area. It looks somewhat forbidding from the beach - dark and enclosed. But inside, it is a revelation. The 5 massage rooms, 2 beauty rooms and large mixed jacuzzi room are all bright and welcoming. 2 of the rooms are dedicated to Thai massages and an ayurveda therapist is also part of the staff. 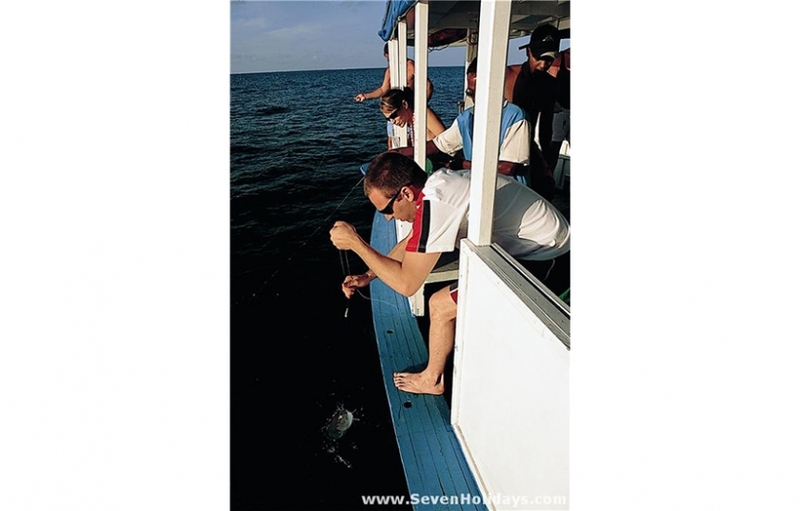 Other facilities seem to be part of a company policy and are mostly inappropriate in Maldives. There is a very large gym, a cavernous hall with badminton and squash courts and an outdoor tennis court, all of which get little use, but they are there if desired. Valtur Kihaad has a delightful atmosphere and a great holiday can be had here, despite the quirky built environment.